I’m so honored to have been invited by the lovely Diane, to share a little bit here today for her blog anniversary week! A little backstory, I first “met” Diane over three years ago when she reached out to me via email, before she even started her blog! 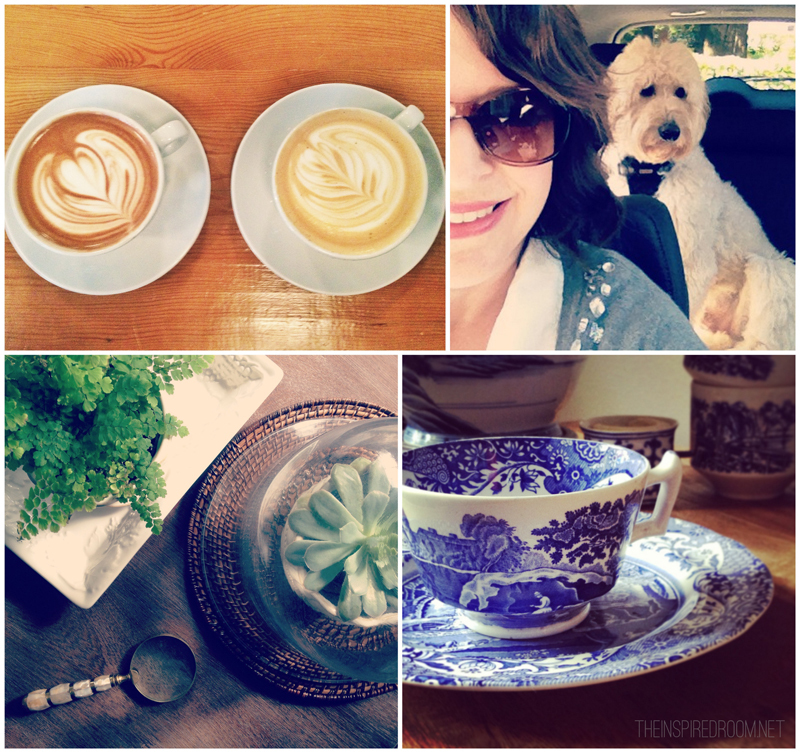 And here we are today, celebrating her first year blogging anniversary! That is a milestone I’m thrilled to celebrate with her. As a blogger myself at The Inspired Room (my blog is nearly six years old now), I am in contact with many many people each week. My inbox is always full and overflowing and my Facebook stream almost gives me a panic attack with so many updates I can’t keep up with. It is easy for names and faces and stories to become a blur! While I really enjoy hearing from everyone in the amazing community we call blogland, I am especially touched when I receive a personal, heartfelt email or comment from someone who reaches out as a “real life friend”— someone that I can connect to on a personal level (in spite of the fact that we’ve never met in person!) And Diane’s first email to me was just that, the first step in forming a real friend connection. We see so many names every day on the internet. So many tiny avatar pictures flying through Facebook or in blog comments. But when a blogger or reader makes this big internet world a little bit smaller by sharing something more vulnerable or personal, such as their hurt or joy in life, or reaches out to be an encouragement to us, we are reminded that these are women just like us. Just like me! We are all out here, living our lives, trying to make each day extraordinary among the ordinary hurts and struggles we all experience. We all need a real and personal connection. We need friends to encourage us and keep us going! Blogging is so much more than showing off how we decorate our home or trying to get the most Pinterest repins or Facebook likes on our latest project — at its best, blogging is really about building relationships. Anyone who thinks otherwise is missing out on the true treasure of this community! Through our blogs or FB posts, we share snippets of beauty to remind ourselves of what we love, to count the ways God has blessed us, and it is an honor to share encouragement with others who may need a little boost or nudge that day to live life to the full. I love that we can use these blogs of ours, whether we write them or just read them, to connect with women all over the country and even throughout the world. Amazing, isn’t it? We can be a real friend to someone who needs us and connect with people we need in our own life to challenge us, inspire us and share encouragement to embrace our own extraordinary life! I’m so excited for Diane to have her blog community surrounding her this week, cheering her on towards year two of blog friendship building! Congratulations, Diane! And I hope each of you lovely ladies are able to find the joy and greater purpose in connecting in relationship through blogland. You are all a blessing! Thank you Melissa for your lovely and encouraging words for each of us. I am so blessed that you would take time from your busy life to celebrate with me today. One day in September, I Googled fall decor and discovered The Inspired Room. Her blog is a treasure trove of ideas, but it was the spirit with which she wrote that attracted me. That also was when I first discovered this wonderful bloggy world. As Christmas time rolled around that year I contacted Melissa to inquire about advertising my Longaberger Lifestyle business on The Inspired Room. She was amazing to work with and a wonderful encourager. Melissa and her blog were the inspiration for me to begin this adventure with An Extraordinary Day. That is why I wanted to introduce you to this extraordinary lady and her blog who were my inspiration. You are Extraordinary Melissa! 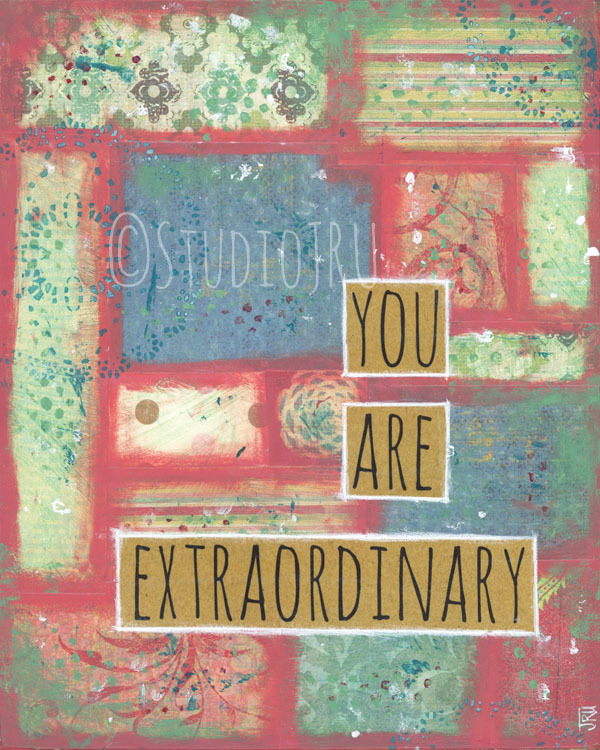 This beautiful inspirational art “You Are Extraordinary” was created especially to help celebrate the first anniversary of An Extraordinary Day by my friend Jennifer, of Studio JRU. She’s a wonderfully gifted and talented artist. Did you notice she even picked up colors from the blog? Isn’t it Extraordinary?! Thanks Jennifer! One blessed person…maybe you!…will receive a reproduction print of You Are Extraordinary in this giveaway! This inspirational art is an 8 x 10 high quality print on Ultra Premium Matte Paper. The artwork is centered on 8.5 x 11 paper, leaving a thin white border. Print will arrive signed and titled on white border under print and securely packaged in an archival bag. ©StudioJRU watermark will not appear on your piece. If you can’t wait to win a print…order yours here. It’s easy to enter this giveaway…. Leave a comment and let me know what makes YOU extraordinary! Want an extra chance or two to win? “Like” An Extraordinary Day on Facebook and leave me a comment letting me know you do. If you already are a follower, just leave a comment saying so. Follow me on Pinterest! Leave a comment saying so with your Pinterest name. Contest ends Monday, May 6, at 9 PM EDT. Winner must have a U.S. mailing address and will be chosen at random and notified by e-mail. Thank you to Studio JRU for graciously providing the art print for the blogiversary. I was not compensated for this giveaway. Barbie of My Freshly Brewed Life is the WINNER! NOTE: There will be a giveaway each day this week. Be sure to come back!! Thanks for stopping by and joining in today’s celebration. Would you share the joy and inspiration here by using one or more of the sharing buttons on the left an invite your friends to have An Extraordinary Day? Thanks!! Please come by again tomorrow for more extraordinary fun!! What a sweet thing to say, Leisa! Thank you! I’ve just been following you for a couple of months or less. You have already inspired me with many a creative idea & many a thoughtful praise for our shared Creator. I’ll be looking forward to your lovely photographs & words of wisdom. Your vulnerability & truthfulness helps us see the real Diane. May God give you the desires of your heart as you keep on faithfully blooming where He has planted you. Blessings! I praise God for you, Carolyn and that He has used me to bless you and you to bless me. Thank you for your wonderful words of encouragement and blessing today. You are Extraordinary!! I am extraordinary because I have a traumatic brain injury and yet God still has used me. Today is a day I’m filled with sorrow. That part of my brain is just missing/ atrophied–so there are many very hard days. But today I do not want to go to a doctor nor praise Jesus nor talk to anyone at all. I want to be the old me. But God has plans and uses the new me lots more for sharing Jesus with others. So easily. But today? I’m just sad. But this too shall pass? I don’t know. But just yesterday as I spoke verses and prayed with a woman going out on the mission field she said I’m a woman of wisdom. All very confusing as it must not be me but Christ in me! Gwen, my sweet friend….I hear your pain today and am so sorry. It sounds like God has supernaturally blessed you to serve Him well regardless of your TBI. Lord, I ask in Jesus’ Name that you would lift Gwen from her place of sorrow today. Bring her comfort, physical and emotional restoration, and help her to know the wonderful treasure she is to you and so many others. Thank you! [hugs] You are indeed Extraordinary Gwen!! Bless your wisened soul. There are days, eh? But LOOK at how G-d continues to use you and the lives that you touch! What a blessing you are to others, Gwen. This post–this sharing of what’s true in your life–touched my life. And I will go into my day lighter, more focused and humbled that I GET to be of service. Thank you for that. And I send prayers of thanks to my Maker–for YOU. I am extraordinary because we are all created in our own unique way. I am the oldest of 4 children. Our mother died the day after her 40th birthday leaving me with 3 little ones to take care of. My dad worked long hard hours. We lived in a coal mining town and attended a three teacher, 6 grade school. I was the first in the area to attend college. All four of us have degrees and ALL of our children have degrees, some masters, and some Ph.D and Medical Dr. Not only that but my Dad was one of 11 children and all but one of them graduated from high school and 4 of them were valedictorians of their class. Grandpa came from France when he was 12 years old and worked in the mines all of his life. He would tell the kids that nobody could take what you stored in your brain. I am extraordinary because somebody expected me to be extraordinary and gave me opportunities and shoves to achieve that. We are all extraordinary but some of us just don’t realize it yet. Thank you for sharing your extraordinary story Dianne! What a wonderful heritage of hard work and education in your family. all you Blogger girls are so awesome and since it sometimes seems I have more web friends than live in person ones-tho thank the Lord I have many of those too—I so wish I could write like you all do! I’m full of stories tho not sure anyone would bother wanting to read them–like the time I had to break into my friend’s house–with her permission! Or the big lesson the Lord taught me at the beach one time about my hurt feelings and anger and what that caused me to miss! whew! I’m full of it! ha! I love all of you! and yes it has amazed me how I can love so many people I’ve never personally met! have a blessed day! You have just teased me with some great stories, Glenda! I would love to hear more!! The craft of writing is perfected through writing. If you saw my old college papers you would wonder how I made it through! Haha! I love words and well-crafted sentences and with time I got better. However…for the record…I have much to learn and a long way to go. All that to say…if it’s in your heart. Start. 10 A truly good wife is the most precious treasure a man can find! 11 Her husband depends on her,and she never lets him down. 13 and with her own hands she gladly makes clothes. 14 She is like a sailing ship that brings food from across the sea. 20 and she helps the poor and the needy. 21 Her family has warm clothing, and so she doesn’t worry when it snows. 22 She does her own sewing, and everything she wears is beautiful…. 25 She is strong and graceful, as well as cheerful about the future. 26 Her words are sensible, and her advice is thoughtful. but a woman who honors the Lord deserves to be praised. 31 Show her respect – praise her in public for what she has done. Oh gads…..LOL He just made me weepy! What a loving thing–what a loving fella. I am extraordinary because my Father in heaven made me that way, and my grand kids agree! I love it!! There’s nothing like a sweet agreement like that!! I have been gifted with a heart of gratitude and a spirit of encouragement. Makes everything all good. Yay God! He makes good people! I am extraordinary grateful that God has blessed me with so many extraordinary people and things in my life, way more than I could ever deserve. And, that’s what makes him the most extraordinary of all! In my comment yesterday, I rambled on and on and forgot to tell you about two of my extraordinary friends that I had to move away from six years ago. They were and remain my two most faithful prayer warriors and dearest friends. What would we ever do without our friends? Truly blessed! I am extraordinary because I have reached a point in my life to realize how truly blessed I am. Yay!! You ARE Extraordinary, Cindy!! And as for the extraordinary in me? It’s probably that passion in me..that gifted patience and love for others who’ve had trials and tribulations to wade through. They matter. And I desire to help them ALL know–they MATTER. Nothing hurts my heart more than a soul that doesn’t have a sense of that being true–and it’s my hearts desire to help folks ‘get’ that. Now, I don’t know that it makes me ‘extraordinary’….but I am told that I get that message across extraordinarily well. We are such blessed human beings, eh? I’d agree with whomever said that about you. They speak truth. Those are wonderful God-given gifts and because He placed them in you…You ARE Extraordinary!! Love a milestone, and your story of encouragement is encouraging in and of itself. Great design on the artwork. Love it! That is such a nice thing to say! Thank you Liz! Jennifer is an amazing artist…we are blessed to have her share her lovely work. You ARE extraordinary! I love your blog…. Happy blogaversary!!! How sweet of you! 😉 Thank you so much!! Congratulations Diane! You have done a wonderful job sharing your life with others. I have a little trouble with the whole extraordinary thing, but my God is extraordinary and that’s all that matters. I am not God, and am content to be my ordinary self, doing ordinary things, in ordinary ways. Your friendship has certainly been an extraordinary blessing in my life, though. Love you! congratulations on your first year as a blogger. What a lovely magazine and lovely lady. I still prefer print magazines and books but would be happy to win this giveaway as it is so very well put together. I receive your post by email and thank you for offering giveaways all week. You said it Sylvia…it is really well put together and the photography is stunning!! what a lovely print and if I should win I would give it to my eldest daughter who is celebrating her 60th anniversary in July. Thank you for being so generous in your giveaways. I receive your posts by email. Love the name of your blog. I’m extraordinary because I work full time, home school, am involved in ministry, know how to juggle with my eyes closed! Love your blog! Seriously girl…I don’t know how you do it…but one thing for sure…God’s hand is on you. Thanks for being such a wonderful encourager….you are blessing! I struggle with extraordinary because I deal with depression. I struggle with worth. I am still learning that I am an extraordinary work of God. Love the picture. God has made you in His image…that is something to hold on to. I pray you grasp what a treasure you are in His eyes and wear it dear daughter of the King. I am extraordinary because I am Fearfully and Wonderfully made! I am a child of God! I am a Mommy! and I am a daughter! Yes! You ARE Extraordinary, Kesha!!! Awwww…that is so sweet Willow!